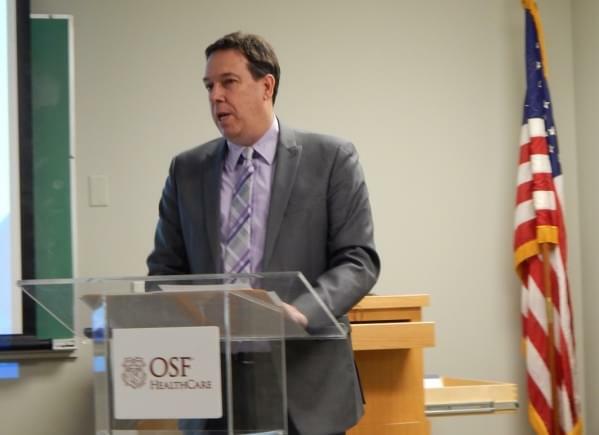 Vermilion County school administrators, health professionals and others are reviewing the information contained in the latest I Sing the Body Electric survey which was released on Friday. It contains results of health-related questions asked more than 1800 county high school students on topics ranging from alcohol and drug usage to body image, fitness and depression. Oakwood High School Principal Tim Lee (shown here) says the survey discovered a new concern…. And Russell says a Vermilion County Mental Health Initiative is reaching out to teens needing help. The I Sing the Body Electric Survey found that nearly forty-percent (39.5%) of teens reported that they felt sad or hopeless (depressed) almost every day for at least two weeks that they stopped doing some usual activities. Twenty-two percent have cut or harmed themselves on purpose in the past 12 months. ‘’Through these surveys we get to hear the voices of our youth – some crying for help,’’ said Melissa Rome, Community Liaison for the Vermilion County Health Department. 3 percent of students said in the 2012 survey that they had taken prescription drugs which were not prescribed for them. The number dropped to 8.3 percent in the 2018 survey. 8 percent of students responding to the surveys in 2004 and 2006 in Vermilion County said they were currently using marijuana. In 2018 the figure was 18-percent. In the 2002 survey 50.4 percent of Vermilion County teens said they had used alcohol in the past 30 days. In 2018 the figure was 30 percent. I Sing the Body Electric is an initiative of OSF Sacred Heart Medical Center in Danville. 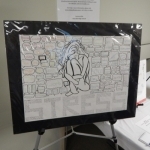 Youth participating in the program use artwork to express their feelings and attempt to help other students.